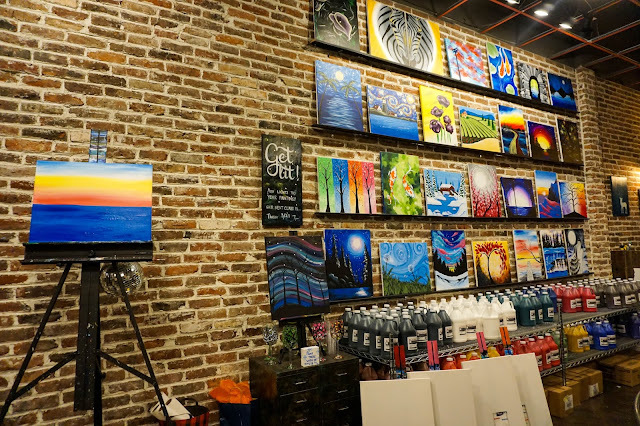 While the Hingham Shipyard is known for its bustling restaurants and marina, Muse Paintbar offers guests an experience to get back in touch with their creative side. Last week we made a visit to the studio to take part in a paint night. The night basically consist of a bunch of people getting together and socially painting a particular picture under the guidance of an instructor. Additionally beverages and small plates are available to enhance the experience. The theme of our night was the mystic sunset. While everyone follows the same theme and starts with a blank canvas, it was great to see the individuality of everyone’s end painting. No matter what skill level, everyone can feel comfortable and have fun making your own unique creation. The instructor guides the class in the different steps it takes to create the painting including mixing the paint to get different color shades and the techniques to create art's characteristics and shapes.